Villas Sol Hotel and Villas Beach Resort perched on a hillside overlooking beautiful Playa Hermosa (“Beautiful Beach”). The resort consists of 110 fully furnished villas in a variety of floor plans, designed to provide the maximum in comfort and convenience while blending with natural surroundings and local architectural traditions. The villas are built in typical Spanish style with white exterior walls and red tiled roof. Local hardwoods are extensively used throughout and all villas have a large terrace with spectacular ocean views for guests to enjoy the gentle breezes of Papagayo Gulf. The villas come in 6 different floor plans ranging from 1 to 3 bedrooms ( 600 to 2,500 square feet). The villas are central air conditioned and also have ceilings fans. 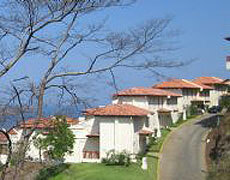 Paradise is reality where the Americas meet in the northwest province of Costa Rica at Villas Sol. They come completely furnished; TV, telephone, linens, towels, cutlery, appliances, just about everything. Just bring your bathing suit. Spectacular sunsets on the Pacific, world class fishing and diving, rain forest, mountain biking, white water rafting, secluded beaches, volcanoes and exotics flora and fauna, just two and half hours by air from Miami and 25 minutes from the new Daniel Oduber International Airport. Carefree tropical living can be yours here.